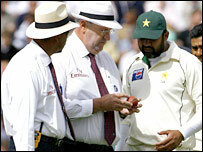 Ball-tampering is one of the most emotive and controversial issues in Test cricket, especially when accusations involve Pakistan. When umpire Darrell Hair awarded England five penalty runs for Pakistan violating law 42.3 for deliberately altering the condition of the ball during the fourth Test at The Oval, the Australian official provoked a huge Pakistani backlash. Ball tampering is tantamount to cheating, everything that contravenes the spirit of this most gentlemanly of sports. 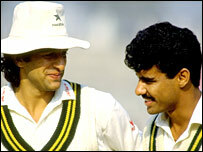 Unfortunately these accusations are nothing new to Pakistani cricket. The slur has tainted the nation since all-rounder Imran Khan first extracted exaggerated late movement with the older ball during the 1970s. BBC Sport examines the stigma of ball tampering. HOW DOES BALL TAMPERING FAVOUR BOWLERS? Bowlers shine one side of a new cricket ball while the opposite is left to deteriorate through natural wear and tear. This process helps bowlers swing the ball in the air. In simple terms, the aerodynamics of bowling mean the shiny side travels faster through the air, while the rough side acts as a brake, pushing the ball in the direction of the rough side. But as the ball loses its early shine, it begins to swing less and it is not until it gets older and rougher that it begins to deviate again, a process known as reverse swing. "As the ball becomes rougher, it will take on a different characteristic as it deteriorates," said former England fast bowling coach Troy Cooley, who helped England's bowlers use the phenomenon to great success during the 2005 Ashes series. "So if you present the ball as an outswinger, the ball has deteriorated so much on the rough side that it takes on the characteristics of the shiny side. "Which means a natural outswinger will become an inswinger and conversely, an inswinger an outswinger." The laws of the game clearly state fielders can polish, clean or dry the ball, but nothing more. The batsmen, pitch and outfield all contribute to the natural wear and tear of the ball, which usually starts to reverse swing around the 40- to 50-over mark during a Test match. However, the earlier the ball starts to reverse swing, the more problems it poses for the batsmen. Bowlers can facilitate the deterioration by manipulating the condition of the ball illegally. The seam, which acts as the ball's rudder when it swings, can be picked with fingernails. The nails can also help to further scuff the rough side of the ball. WHY IS IT SO EMOTIVE? There could be no greater slur on sporting integrity than cheating. And ball-tampering is exactly that. The fact that most allegations have involved Pakistan will not be lost on the International Cricket Council, the sport's governing body. Reverse swing has its origins in Pakistan. The hard, abrasive sub-continental wickets helped fast bowlers Imran Khan, Wasim Akram and Waqar Younis pick up hundreds of Test and one-day wickets through late deviation and movement with the older ball. But the trio's accomplishments have always been shrouded by an underlying accusation that their wickets were collected by illegally altering the ball, despite their claims to the contrary. At the height of Wasim and Waqar's powers, English umpires Ken Palmer and John Hampshire ordered the ball to be changed during the interval of a one-day international between England and Pakistan at Lord's in 1992. Like the circumstances at The Oval, images of the ball in question and the umpires' report were never released to the media, and nothing more was ever proved. Imran made matters worse when he admitted in 1994 he had "occasionally scratched the side of the ball and lifted the seam". He also said he had used a bottle top to scuff the ball to help the ball swing more during a county game for Sussex against Hampshire in 1981. And the controversy has not ended there. Waqar, who is Pakistan's current bowling coach, was handed a one-match suspended ban and fined 50% of his match fee for tampering with the ball in a one-day international against South Africa in 2000. And fast bowler Shoaib Akhtar was found guilty of the same offence during a Test match against Zimbabwe in November 2002, serving a two-match ban as punishment. However ball tampering and its other derivatives are not an exclusive Pakistani malaise - far from it. Former England captain Mike Atherton hit the headlines with the "dirt in the pocket" scandal in 1994, when he was caught rubbing dirt on the ball against South Africa at Lord's. And Indian batting giants Sachin Tendulkar and Rahul Dravid have both been charged by the ICC for altering the condition of the ball in the last five years. Dravid was fined 50% of his match fee after cameras had caught him unwittingly shining the ball with fragments of an energy candy he was chewing after it had stuck to his finger during a one-day match against Zimbabwe in 2004. And Tendulkar was handed a one-match suspended ban and fined 75% of his match fee for "acting on the ball" in the second Test between South Africa and India in Port Elizabeth in November 2001. The punishment handed out by ICC match referee Mike Denness provoked an enormous backlash in India, forcing Denness to clarify that Tendulkar had been charged for "removing grass from the ball but not having informed the umpires". The scenes at The Oval will be indelibly etched as one of cricket's darkest days, but it is unlikely it will be the last time the controversy of ball-tampering will rear its ugly head.